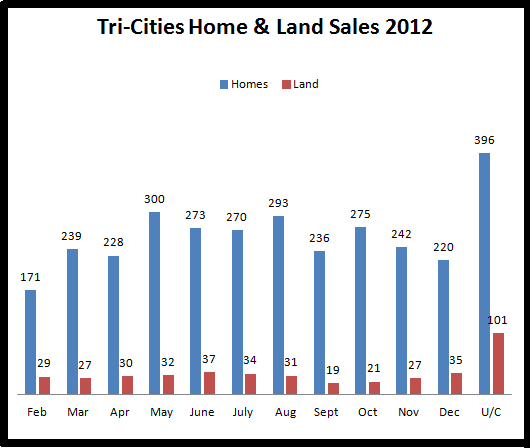 The results are in for 2012 home and land sales in the Tri-Cities, WA. We’ve been showing and selling homes in Benton City and Burbank, so we’ve expanded our charts to include the smaller cities in the area. 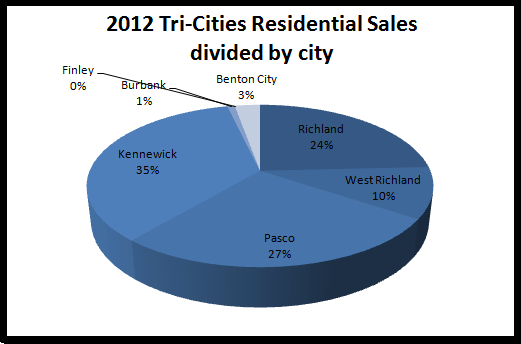 Our numbers for 2012 include sales in Richland, West Richland, Pasco, Kennewick, Finley, Burbank, and Benton City. Sales remain stable and steady with 2903 home sales and 334 land sales. An additional 396 homes and 101 lots were under contract for sale at the end of the year. One thing we’d like to point out is that homes are selling year-round. Spring is historically considered the best time to sell a home, but as you can see, buyers have been making offers every month! Please contact us at (509)845-4570 if you would like more information about buying or selling a home this year…we’d love to help you out!